I've never been so wrong in my life. Picturing Coachella in my head prior to experiencing it was a large, trampled grass field, one gigantic metal stage with speakers so far away the music floated up into open air of nothingness, and a million fans sprawled out like dumped over crayons on the floor. The sun beating down on them and 2 full days with no shower, the smell of bodies rubbing up against each other filled my nostrils. I had anxiety with just the possibility of going to Coachella, let alone willingly going... And to polish it all off, the thought of using a rancid smelling porta-potty that I have to share with 90,000 other guests made me repulsive. Well, I faced my fears and walked out alive! Here is my first ever experience with a music festival and what to expect walking into Coachella if you're on the fence. I also included a couple pointers if you're like me and want to be prepared for every possible scenario! Peeling back the box containing your actual life for the festival is like Christmas in April. Your stomach is filled with butterflies of anticipation and your mind races with the magical feeling looking up at the neon glowing carousel at sundown. My crew of about 15 people gathered in LA Thursday evening and crammed a sprinter van full of goodies for the weekend: cooler with drinks, snacks, 3 cases of water (trust me, never enough water), suitcases, and we were on the road around 2pm to Palm Springs. We pulled up to our shared home about 15 miles away from Indio and moved in with high expectations and excitement for the weekend. Immediately, the 7 girls were crowding into one room trying on clothes and figuring out what we should wear for the weekend. Crochet tops, jean shorts and glitter stained our floor as we got yes's or no's to make us feel like boho-fairy goddess earth lovers for 3 blissful days. With no worries, I unpacked my already prepared outfits and tried them on to get one last look. Feeling confident, I stuffed them back into my suitcase and pushed it into the corner so we could blow up our air mattress. Four girls, one 300 square foot bedroom and 7 bags of things later, we managed to fill up the second bed and toss pillows where we knew will be our safe haven after long days in the desert heat. Our man alarm woke the house up around 8:30am with Katy Perry - Chained to the Rhythm blasting through the cement walls; you can imagine our response... 20 people being woken up by that voice makes you dig your head a little deeper into your pillow to drown the annoyingness. Eventually I peeled myself out of the sheets and perked right up by the reminder of where I was. Coachella day one was finally here. Right now. I rushed to my bag, squirmed into some shorts and top then joined everyone in the living room. Immediately, I noticed I was the only one dressed to find out we weren't leaving until around 2pm. Rookie mistake. But I wanted to gallop to the festival right away I couldn't contain my adrenaline! Instead, I pulled on a bikini and lied under the refreshing 80 degree weather for a little tan. One thing I misinterpreted: the parties. I heard about these crazy weekend 1 Coachella parties and anticipated a day playing beer pong or sipping on a mixed drink at a self-made bar top. Once again I found this completely incorrect and underestimated. I met countless party attendees that didn't even have wristbands for coachella; they just went to the parties. I couldn't fathom why someone would want to do this until I attended my first party at the 1OAK house. It was just like you'd imagine in a movie. Security was off the chain, celebrities like Taylor Hill and Tyga popped in for a drink and some fun. The home itself was basically an estate of a normal person's home times about 100,000. The main entrance welcomed you with a large staircase down to security enforced front doors that would make anyone feel important. Once inside the opposing wall is completely off and opens into a lake. Yes, a lake. And if that wasn't enough, they have a island with a fully stocked bar and jet skis ready to be powered through the center of everything. I was in awe at what I thought must've been a resort of some sort, barely able to fathom it was a home. Throughout the afternoon, I sipped on ice cold water and ate sushi off of walking platters. The music was booming and I was enjoying my first taste of Coachella, even if I hadn't actually arrived yet. As if one party wasn't enough, we carried our dancing shoes to the real party, Coachella!You know you're getting close when the two lane roads stop dead in traffic about a mile away from the floating balloons. This poor little town was already shook up by the vast amount of people who packed up and left LA just for this one particular weekend at Coachella. The parking is organized by wristband, and we were lucky enough to be VIP/Artist Pass so we could drive practically to the security gates. After some metal detectors and bag checks, we were at that moment. The moment where I find out Coachella is far more than a large grass field filled with smelly humans. Gathering myself as we step into the VIP entrance, I am immediately consumed by an air of clarity. All of my previous generalizations and assumptions were diminished by the sweet crisp air filled with an array of smells leading from ice cream to BBQ, mexican food to beer. If I closed my eyes long enough I could feel myself in the center of Downtown Disney as a child. My heart racing with excitement, my mouth watering for something sweet and an adventure I would cherish for years to come. The lights were hung so delicately off of trees and signs leading you toward something. The palm trees spread a generous amount of shade on the grass where relaxing Chella goers napped, ate or chatted with friends. The vendors lined the edges with signs from "Alfred's Coffee" to "Backyard Bowls." Options were endless and everywhere I looked there was something new and shiny to take in. But there was one thing that I couldn't wait any longer for: The Bathroom. My eyes scanned side to side recognizing faces from social media, noticing a couple kissing in line for smoothies. I saw a group of friends sitting in the grass with their backpacks slinging to the floor from the long day carrying their only possessions. Before I knew it, the bright neon sign was right in front of me, Restrooms. With squirming legs, I reluctantly walked under the tent where the porta-pottys were divided by a plastic wall that looked like it could fall over any minute. There was only one way in and one way out, and I wasn't sure if I would make it back out. I held my breath and tried to mentally prepare for the human bodily fluids from food, alcohol and who knows what else from a weekend in the desert. I was immediately regretting the coffee along the way, but willingly threw open a door with a green vacant sign and climbed inside. I looked around. The floor was clean, the toilet was empty and there was plenty of toilet paper with sanitizer for your hands. I let out my breath and inhaled in again through my mouth; can't risk the smell. 45 seconds later I walked out of the bathroom with an empty bladder and another thing I was wrong about. From this point forward I decided to leave behind my expectations and doubts. I was ruining my first impression by creating an image in my head that I thought would be one way, but in reality the situation was misinterpreted. I let go of the anxiety, what if's and future plans to let myself actually live Coachella. I decided to take the next step with an open mind and heart. I let myself feel what I believe is freedom and let the festival take me on a journey. With this mindset, my weekend became unexpected, unplanned and completely free. Our VIP passes allowed us all weekend to have the time of our lives. There is an entrance next to the main stage with a grass area to watch and up further is a collection of nicer vendors, a fully loaded bar that takes up the entire middle, and our own bathrooms with nicer facilities and maintenance; if that wasn't enough, VIP gave you better viewing for the live music where you could climb into the recording/sound area above the rest of the average crowd (see above photos). Day 2 brought back the incredible Disney feeling as we created our list of artists to see that day. All of us had our favorite band playing on Saturday and scheduled meet-ups accordingly so we could do as we wish. My friend, Tori and I, had other plans in mind. It was Day 2 and we had barely grazed the surface of this huge festival! We pulled out our camera and started to walk, well half dance/skip, to scope the 45 acres of heaven. Eventually, we made our way to Martin Garrix to see him perform. As we were strolling toward Sahara, people started coming in waves. It was like Red Rover from when we were kids. Everywhere we tried to walk, hands were linked and we couldn't get through. In between all the madness, I wanted to see if VIP viewing was actually worth it. I decided to separate from the group and go into the crowd. This is like the scary part in a movie where the monster is chasing a girl and she's running as fast as she can with a decent lead, but then she trips on an obvious branch and gets stuck. I didn't realize I was her until I got to the front of the stage for Martin, and I couldn't get out. My phone had no service, there were at least 25,000 people trying to make their way into the tent to see him, and I was glued to where I was. For a minute, I was terrified. Alone, stuck, no phone service, and no idea where our group was. I was panicking and trying to push my way out when I stopped myself and was reminded that I wanted to let coachella to take me on a journey. I smiled and decided this was it. This is where I am meant to be. And I turned to my right, said hello to a group of girls and found out we were all from small towns living in LA. And I turned to my left to say hi to a trio of guys about my age to find out they were mutual friends of mine. We all had a moment of walls down, no worries and open minds, and in turn the next hour was whimsical. The lights and lasers turned on, we grabbed hands and sang as loud as we could to the lyrics. When the time was right and the beat dropped, as if it were born in us, we began to jump. And jump. And jump. Before we knew it the delusion was swept away with the crowd of people as we had come. No goodbyes or number exchanges, just a split second of chemistry and vulnerability. We will probably never see each other again, but this was the highlight of my weekend. 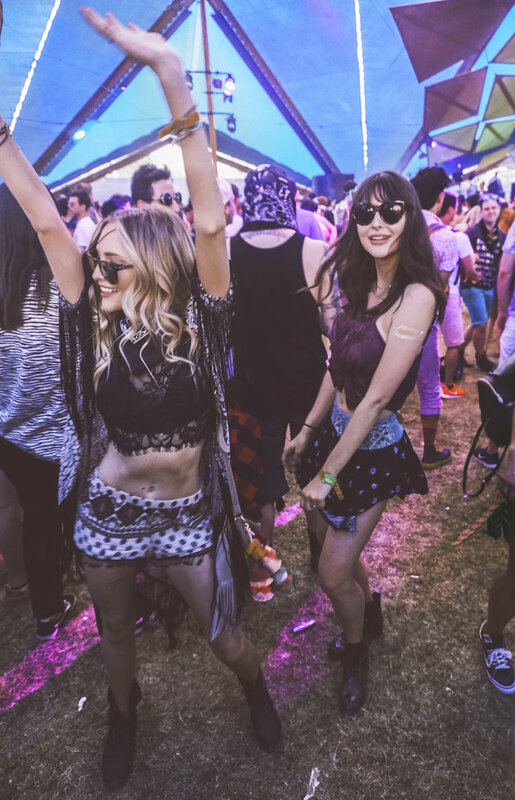 As fast as it had come, Coachella was already on day 3. I felt like I'd just barely got to know the place, but at the same time the blisters on my feet and bags under my eyes told me it was time to go. I woke up to a quiet house since some of our roommates had left, went elsewhere or were already gone for the day. That was one thing I found funny at Coachella; everyone goes together but ends up getting separated. The weekend is filled with so many activities and more friends than you've been able to see for the past year, so naturally people go with whatever seems right in the moment. By day 3 you've realized one of your friends were gone since day 1 at midnight and text them to catch up, that's just how it goes. Around 2:30pm, one of my friends invited me into the kitchen to surprise me with an Artist Pass! The last day was the perfect time so I could really understand the value of an Artist pass. Because face it, I would have some seriously high expectations coming back next year after having an Artist Pass all weekend long to General Admission, especially since this was my first music festival ever. I was so excited because these wristbands aren't for sale; you have to know somebody. It took us behind a whole new section with Golf Carts to take you places, actual bathrooms, places to charge your phone. It was like a cut out of Urban Homes with nice grass and wood benches. And just like VIP, Arist passes took you right to the front of the stage with no crowd and access to backstage. I didn't think the weekend could get better until I looked Kendrick Lamar in his eyes and could literally jump on stage if I wanted. Day 3 brought a series of emotions: appreciation, humbleness, fatigue, memories, warmth, hope. I walked out with a different perspective and realized not all of life's treasure are planned. Sometimes letting life take you along a journey opens up opportunities you couldn't have put together yourself. That some of the most prized memories are the ones that came unexpectedly and overwhelmingly fast. They arrive and before you know it, you're reminiscing on the moments you had 10 minutes ago because of how it touched you. I realized I need to carry this lesson with me in my suitcase home, to live in the moment. I left with a feeling of gratefulness that I am able to go and experience a festival and become inspired by a movement it has created. I have seen Coachella compared to Woodstock with its peace and love attitude, and I wasn't so sure this was something that could actually make a change. But as I experienced it, the energy of this festival, in a little tiny town in the middle of the desert, changed my mind. My last night I met with a photographer to shoot, and I watched in awe as all of these 90,000 people had come here for this one event. We all had different reasons why we came, but the feeling we all felt was equal. The carousel slowly lit up as the sun fell behind the mountains, and the palms trees began to glow green, purple and red one last night. We picked up the camera and snapped these memories in a photo to look back at years down the road. The photos we took in this moment will bring us back, but the story and feeling behind the image posing in front of a carousel at sunset will rush back like a wave of the first music festival and how it changed your life. Which outfit did you like best? Check out my #ootd from the weekend and shop your favorite looks! Headband: Madly Vintage - Sunglasses:Woodzee - Top:LF Stores - Shorts:Forever 21 - Fringe Cardigan:Mom!